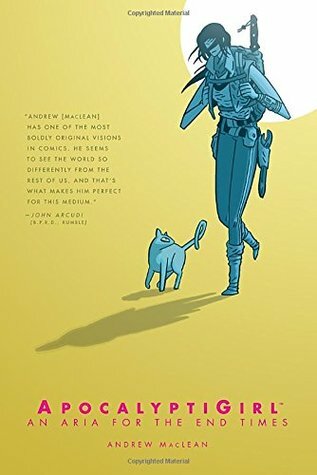 The premiere graphic novel from underground sensation Andrew MacLean (Head Lopper), ApocalyptiGirl is an action-packed sci-fi epic! I typically start my reviews with a synopsis of the book, but, to be honest, I am not entirely sure what the plot of ApocalyptiGirl actually was. The main character of Aria is on a mission to find a lost relic that will give her and her people immeasurable power. Her only companion is a cat named Jelly Beans. Aria has been navigating the desolate earth for years, avoiding various groups of people in order to keep herself alive. When I quickly flipped through ApocalyptiGirl, I wasn't immediately drawn in by the artwork. It isn't bad by any means, but it's not a style that is very appealing to me. Ultimately, however, the art ended up being the best part of the book for me. There is so little plot in this book that it is really difficult to review. As I said, I was very confused about the story that ApocalyptiGirl was trying to tell. There were giant holes in the plot that left me confused and wondering if I had missed something. For about the first half of the book, I was enjoying diving into the post-apocalyptic world and learning how everything worked. But when Aria's mission was introduced, I felt like a lot of information was missing. There were supposedly two main groups living in the wilderness, but we barely got to see them or learn anything about them. And then when Aria's backstory was finally revealed in the twist at the end, I was so completely confused. I still can't figure out exactly how everything tied together. Ultimately, ApocalyptiGirl tried to accomplish too much of a story with too few pages. The plot could have been interesting and made for a fun adventure, but there were giant plot holes that were too large for the reader to fill in with their imagination. It takes a lot for me to really dislike a graphic novel, but I was very disappointed in ApocalyptiGirl.